OSWEGO – After a break for the summer season, Lakeside Artisans’ series of Paint Parties will resume on September 12 from 7 to 9:30 p.m. in the Community Room of the Canal Commons at 193 W. First St.
Cindy Schmidt, creator of the well-known Cranky Cats Collection, will be the instructor for the evening. She brings her unique perspective and sense of humor to make her Paint Parties a really special experience. 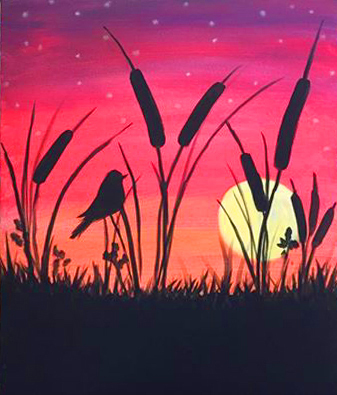 The painting for the night will be Twilight Marsh, with striking colors and a dramatic sunset silhouettes of cattails and birds. Gift certificates for Paint Parties are now available at the Lakeside Artisans. Give a certificate and the recipient can register for any of our upcoming Paint Parties! Reservations and gift certificates for the Paint Party are available in the Lakeside Artisan’s Canal Commons shop at 191 W. First St., in downtown Oswego.